She dreams of one day enrolling at Stanford University in California's Silicon Valley. Eventually, she’d like to learn sign language and become a lawyer who specializes in working with hearing-impaired clients. But at the moment, 16-year-old Patience Hall is a proud dual-enrollment student at Middle Georgia State University. 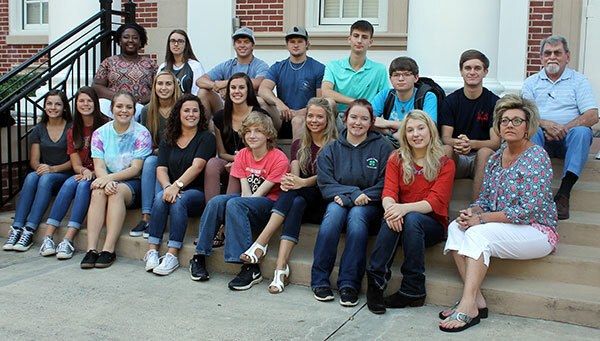 Last spring, Pulaski County’s Hawkinsville High was the only school in the region to receive a Georgia Student Finance Commission grant to help provide transportation to college campuses for students participating in the state's Move On When Ready program. As a result, Hall and the other Hawkinsville students – mostly juniors and seniors but some sophomores, too – board a bus at their high school every Monday and Wednesday morning. The driver, Larry Daniels, transports them to the Cochran Campus, where they disembark in front of Walker Hall and walk to classes in political science, history and English, among others. Move On When Ready (MOWR) is Georgia's dual-enrollment program that allows students to earn college credit while working on their high school diplomas. MOWR replaced what was known as Accel, along with the HOPE Grant for dual enrollment and other earlier programs. The new Move On When Ready program covers tuition, mandatory fees and required textbooks. The program recently expanded to pay for eligible high school students to take college courses during summer semesters. Previously, it funded fall and spring semesters only. MOWR is such a jaw-droppingly great deal for qualified students – some earn as much as two years’ worth of college credit with virtually no out-of-pocket expenses - that it’s almost like legal stealing. The transportation grants make it even better. In the past, Georgia high school students taking college courses typically had to drive themselves or find rides to the postsecondary campuses. The recent state legislation that consolidated all dual-enrollment programs into Move On When Ready set aside money for travel grants to help students for whom transportation might be an issue. The state awarded Hawkinsville High $54,000 to pay for fuel, insurance and the use of a Pulaski County school bus for the 2016-17 year. Daniels, retired transportation supervisor for Pulaski schools, was hired part-time to drive the Move On When Ready bus. “I’d like to earn enough credit to get an associate’s degree by the time I graduate” from high school, said Wesley Burch, 16, who is interested in a computer programming career. His older brother was also a dual-enrollment student, Burch said, and his parents “are thrilled” that he is following in his footsteps. Alex Downs, 16, said she finds college is a little intimidating. But that’s a good thing. “It won’t be as big of an adjustment when we go off to college,” she said. Granted, Move On When Ready isn’t for everybody. Participating high school students have to meet admissions requirements and demonstrate better-than-average motivation. Hawkinsville student Jenna Obert-Thorn, 15, acknowledged that some otherwise qualified high school students decline dual-enrollment opportunities because they don’t want to put in the extra work college courses require. Parents and students interested in learning more about Move On When Ready should see their high school counselors and visit http://www.mga.edu/admissions/MOWR.aspx. Photo: Hawkinsville High School students who are MOWR participants at MGA, along with their guidance counselor and bus driver. They are shown in front of Walker Hall on MGA's Cochran Campus. Back row, L - R, Anjunita Davis, Rebecca Brannen, Ray Griffin, Wesley Burch, Gracyn Kemp, Dalton Cross, Larry Daniels, bus driver. Front row, L- R, Kayleigh Morrison, Jenna Obert-Thorn, Alex Downs, Mackenzie Gilbert, Meg George, Sarah Bowen, Aodan Campbell, Lizzie Gainous, Patience Hall, Laura Black, Amy Black, guidance counselor. Not pictured are Devin Cheek, Terry Cheek, Toni Lynn Gaultney, Stephanie Herndon, Dalton Hill, Ansley Holland, Ana Kilgore, Shivani Patel, Tiana Singletary, Christopher Whitaker, Emily Williamson.